We were delighted to be back in the Yorkshire Post again last weekend. This time it was in the property supplement, offering our advice on moving house in the winter. People often think they need to follow the pattern of putting their house on the market in Spring, meaning they can move during the summer or autumn and be nicely settled for Christmas. But, of course, life doesn’t always know to follow that plan! And although you may put your home up for sale in April, it might not sell for six months, leaving you most definitely in winter-move territory. A winter move isn’t something to cause additional concern – at McCarthy’s we are used to adapting to different weather conditions. Although, having been in business for 50 years, we did just miss the famous Big Freeze of 1963 – but we were definitely around for the coldest winter in 100 years in 2010! However, there are some top tips which can help you ensure a smooth winter move, so you’ll be safely unpacked in your new home with your feet up in front of a roaring fire before you know it. People are often surprised to hear that the removals side of our business is still very busy over the winter period, especially in the approach to Christmas. So, as with any time of year, try and plan in advance, and get a removals firm booked in asap. Always remember tochoosea BAR-approved removals company such as ourselvesfor extra peace of mind. If you’re considering hiring a van and moving yourself, bear in mind the road conditions might be icy. Will you feel confident driving a van in those circumstances? The vans you hire yourself will usually be smaller, so consider how many trips back and forward you will need to do. We do also offer a man and van service, if a full removals service isn’t required. Shorter days mean moves can often be taking place in the dark. Utilities will be additionally important! Make sure the electricity in both properties will be connected. You’ll probably not want the heating on for moving day as the door is likely to be open as things are carried in and out. But if it’s really cold, you might want to have a portable heater in at least one room where people can warm up – maybe the bathroom! Also, take spare lightbulbs for the new house (you never know what people will take – we’ve known some people strip out every light bulb in the property, which can be a problem on a winter day). 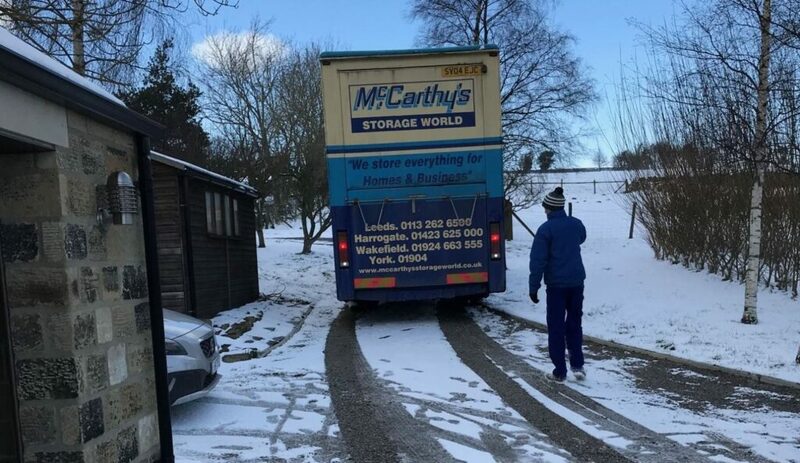 Keep an eye on the weather forecast – but, in reality, there’s not many occasions when the weather here is so bad that a removals van couldn’t get out. That said, if you’re moving somewhere remote, up a big hill, and the snow is one foot deep, it may be more tricky! Raise any concerns you have with your removals company to ensure there’s adequate plans in place. If there’s snow or ice, make sure pathways are clear. We want to avoid injured movers and damaged belongings! It might be worth buying a bag of grit to have handy. You don’t want to ruin your new (or old) carpets, so protect them as much as possible from muddy boots and wet shoes. People will be traipsing in and out all day, so shoe removal will be impossible. Consider buying a carpet protector or using towels or flattened cardboard, carefully stuck down – just ensure there’s no trip hazards. It’s sensible to keep important cold-weather items close to hand. That could include things like winter coats, duvets, blankets, hats and gloves, de-icer, candles and a torch – maybe a snow shovel if the weather is going that way. Either have them clearly labelled and flag them to the removal team or ideally put them in your own vehicle. Use good quality boxes for your belongings. If it’s raining or snowing they might get wet during the move, and you want them to stay strong and keep the items inside protected. Dress in layers – it’s likely you’ll be in and out all day as you direct the removals’ team, and move belongings around. Dress like it’s the arctic and you might find yourself overheating – especially if you’re dashing around emptying boxes! Of course, removal crews like being fueled by cups of tea at any time of year – but especially so during the colder days! Keep a kettle handy, along with tea bags, mugs and milk, and you’ll be very popular. Bring out the biscuits and you’ll get extra brownie points! If we can give you a hand with your winter move, why not get in touch?